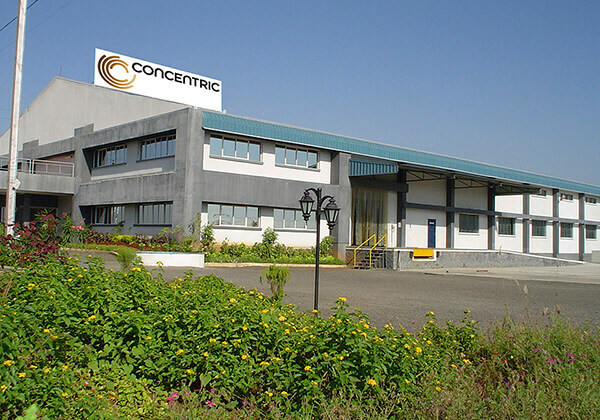 Concentric established operations in India in 1999 at Fursungi - Pune. In January 2004 a new purpose-built state-of-the-art facility was completed in Lonikand, also in Pune. The first phase, comprising 40,000 square ft. of manufacturing space, is already fully operational and a further 40,000 square ft. has been put aside for future expansion. The new plant is equipped throughout with modern CNC machines, operating in a true lean environment. All assembly and test stations are automated or semi-automated and the whole plant benefits from a total preventative maintenance and continuous improvement regime. The factory's main products are water pumps, oil pumps, and fan supports for diesel engines. The customer portfolio in India includes TATA CUMMINS and Cummins India, while global customers, such as Cummins, Caterpillar, John Deere, Chrysler and JCB are serviced through the Concentric Group. Concentric Pumps Pune Pvt. Ltd. Gat. No. 26/1, 27 and 28 (Part), (Near Sanghar Warehousing, Off Pune-Nagar Road), Vill: Lonikand, P.O: Lonikand, Taluka: Haveli, Pune: 412216, India.